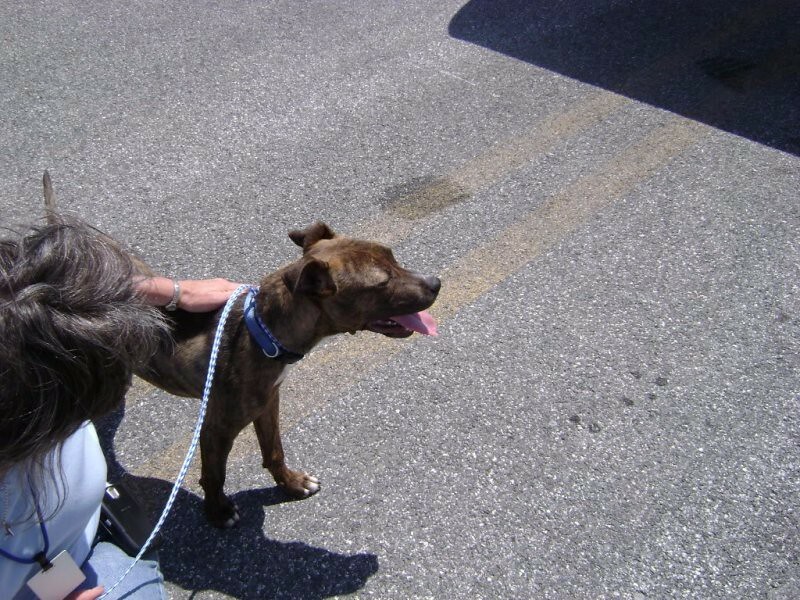 Farley, a 5-month old pit mix puppy needed to get from Simpson County Shelter in Kentucky to a rescue organization in Philadelphia. 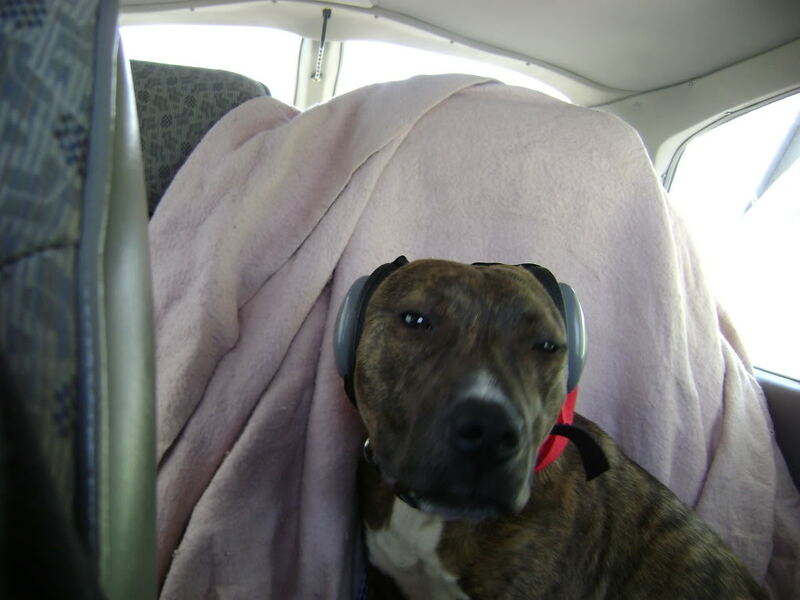 Team Mutt Muffs flew the last leg of this three leg mission. 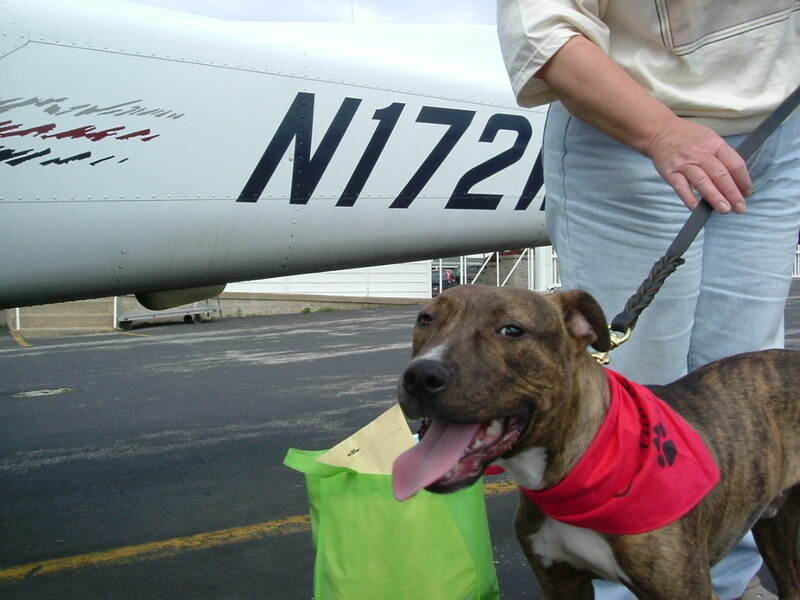 We meet up with Farley at the Carroll Co. airport in Westminster, MD, where Pilots N Paws volunteer Elliott has flown in with Farley from West Virginia. This breed gets a lot of bad press. Most pit bulls make wonderful pets. Farley just loves people. But after a while, his eyelids started to droop, and sweet Farley took a snooze. Mission Complete! Farley was a sweetie and is now with Rosemary in Philadelphia and waiting for his permanent family. We hope he is adopted soon. He is very loveable. Wait until you meet Farley. He is a love bucket!!! He is so cute and sweet and friendly and good natured. He has the brightest, most alive eyes. 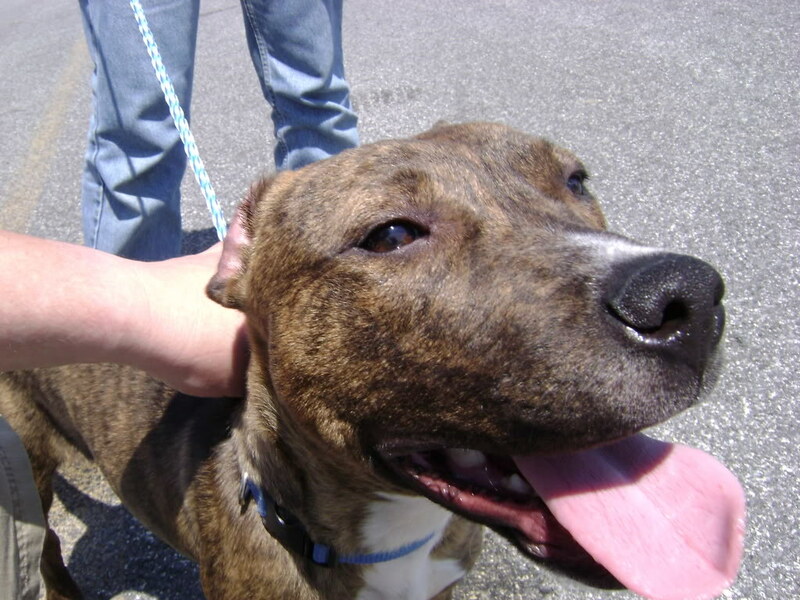 It is like he recognizes –and plans on fully enjoying—that he will have a long, full life as a cherished member of a family that is waiting for him somewhere out there because unfortunately the vast majority of KY pitties either live terrible lives or end up at shelters, that are overwhelmed with them, and euthanized. I think Farley knows what a lucky boy he is. Farley is a bit on the thin side and needs to be fattened up some, all in due time of course. But he ate well tonight; even after a day full of changes. He is just rolling with the punches. This would stress many dogs out, understandably, but he hasn’t lost a beat. 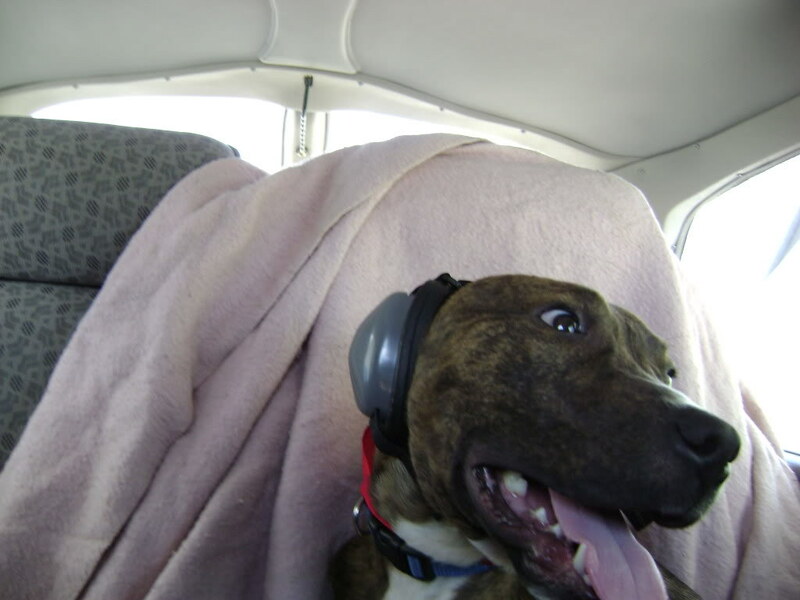 I want to thank everyone who has helped Farley get on his way to find his “furever” home. Ashli for doing such a terrific job at the Simpson County Shelter in Franklin, KY. It is a small shelter, in a rural county in an impoverished state and she has a hard job trying to place as many animals as possible. Thanks to Rosemary for making room for Farley to join her rescue. Thanks to Pam Reed for getting Farley to Columbia. And last, but definitely not least, are Elliott and Michele. All I can say is what good is having a place to go, if you can’t get there!!! :) Thanks to you Farley will be able to continue on his journey to find his furever home. And he gets to do it in style; traveling in private planes no less!! I cannot thank you guys enough for saving Farley. I know it is sad but he is my token pitbull that I got to save this year. I pass by all their faces and their wiggly butts and know that I have to put them on the euth list over and over again, the ACO said that basically when they walk in the door they are dead and that is so sad. We enrich their lives by toys and time outside playing together or one on one with us but still...I only get to save one or two a year and it is heartbreaking for me so I am happy today that a sweet wonderful boy got his chance, his chance to show everyone how wonderful pit bulls can be. He doesn't have a mean bone in his body and loves everyone and that is the breed in a nutshell when they are allowed to be themselves. So thanks to everyone, what you have done means the world to me, thanks Roberta for getting all this together and coordinating everything, Farley would not have made it if not for you and of course Rosemary who didn't have room for "just one more" but made room for him by trusting my judgement, a person she has never met before, and I appreciate that so much, your kindness I hope will be repaid in many ways by Farley! I thought you would all like to know that Farley was adopted this aftenoon! As long as he behaves himself with the 2 resident kitties, I think he is going to do great there! The couple who adopted him are young but refreshingly responsible and mature. She is 25, he is 26. Three years ago, they started a 250 acre dairy farm from scratch, the husband runs the farm, that's what he really wants to do and went to college to get a degree in animal sciences so he could learn how to run a dairy farm. The wife, Christine, works at the Quakertown Veterinary Clinic which is a very good and very large practice. They have 20 small animal vets and 15 large animal vets. And as long as he is well behaved (and of course we all know that he is! ), she is allowed to take Farley to work with her which is fabulous! She says a lot of the people who work at the clinic (they have over 100 employees) have pit bulls so you know they are all going to love Farley.